At a tribute dinner the guest of honor is feted, lofty and noble sentiments are expressed, and "toasts were exchanged, ardent and eloquent." Then we are given a view of the table: "The dessert lay strewn about in disorder on the tablecloth, and on Alencar's plate cigarette butts were mixed with bits of chewed pineapple." (Book 1, Chapter 6). And unbeknownst to the guest of honor, one of the men offering toasts of undying friendship is sleeping with his wife. "The Countess selected a bud with two leaves and came up herself to pin it on his frock-coat. The warm scent of verbena rising from her heaving breast assailed Carlos's senses. She took a long time pinning the flower; her fingers were tremulous and slow, and seemed to linger and sleep on the cloth of his coat. . .
"It was not worth taking one step to reach anything on this earth—because everything resolved itself, as the wise man in Ecclesiastes had already taught, in dust and disillusion. 'Nor I!' agreed Carlos, with conviction. . . 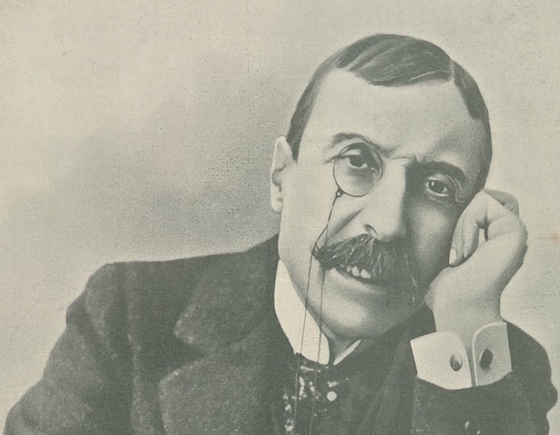 The Maias is about the decadence of a family, a society and a nation, but at the same time Eça undermines grandiose narratives about progress and renewal by constantly intruding the comedy of human incompetence and vanity. We follow the adventures of Carlos, the sole male heir of the Maias, who dissipates his modest ambitions in an endless social round of dinners, theater, horse races, love affairs, and duels threatened but somehow never fought. In a letter to a friend Eça called The Maias "that vast machine of a fresco done in sombre colours, in boringly monumental proportions, pompous and frivolous, which may well earn me the name of the Michelangelo of the insipid. Oh well. . ." Of course it's not Eça's novel but the world it depicts that is pompous and frivolous. At the same time that world enforces rigid social mores that destroy happiness and lead inexorably to tragedy. The obvious comparison (and possibly a source of Eça's technique of ironic undercutting) is Flaubert. Eça had both an insider's and an outsider's perspective on the society he depicts so scathingly. Born out of wedlock, he was only acknowledged by his mother after he'd turned 40. (His parents married when he was four; despite being unacknowledged, Eça took his mother's maiden name.) In his late 20s, after earning a law degree, he was appointed to the consular service and thereafter largely lived outside of Portugal. He was sent on official missions to Cuba, the United States, England (where most of The Maias was written), and France, where he died in 1900 at age 54.
. . .that night as he lay beside Maria who was asleep, tired out, he felt, like the first cold breath of death, a presentiment of what might come. Update 22 December 2018: The Maias was selected for my Favorites of 2018: Books. 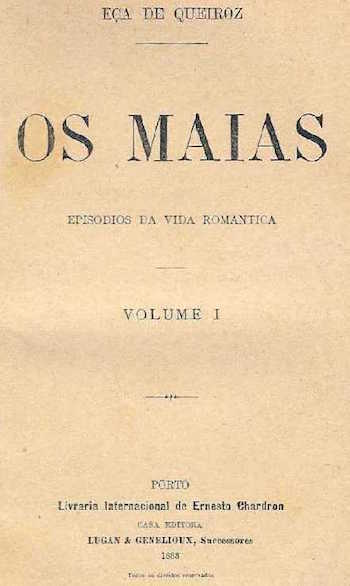 José Maria de Eça de Queiroz, Os Maias (The Maias, 1888), translated by Patricia McGowan Pinheiro and Ann Stevens, J.M. Dent, 1986; translation originally published by The Bodley Head, 1965. There is another translation by Margaret Jull Costa published by New Directions in 2007. Arthur Schopenhauer, Die Welt als Wille und Vorstellung (The World as Will and Representation, 1818-59), Vol. 1, translated by E.F.J. Payne, Dover, 1966, p. 196. Blaise Pascal, Pensées (Thoughts, 1670), translated by W.F. Trotter, E.P. Dutton, 1958, 171: Misery.